Hey folks. 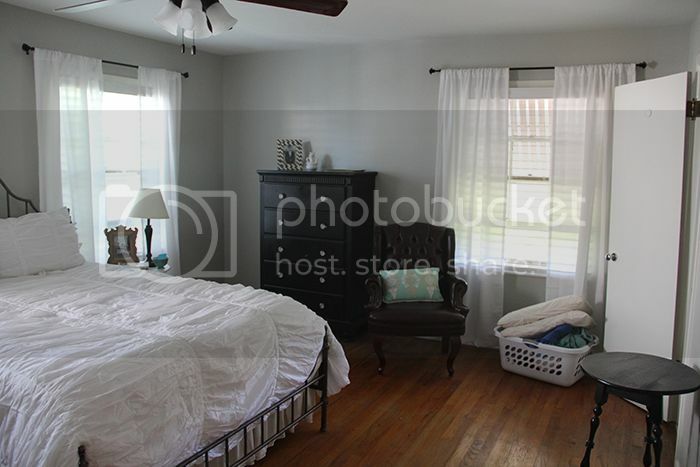 Let's take a break from the seriousness of budgeting and finances to take a look at the evolution of our master bedroom. Literally, that is a photo that I think I texted to someone to show them what I was working on. Hobby Lobby bags are strewn on the floor. Actually, let's rewind. 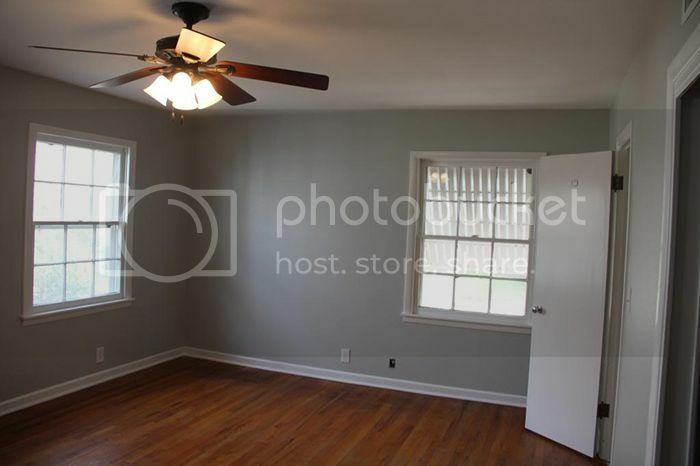 Before we moved into our house, and I was photographing some before shots, this was the only room I was asked not to photograph. If that tells you anything about it's state. Which lead us to the photo I shared above. 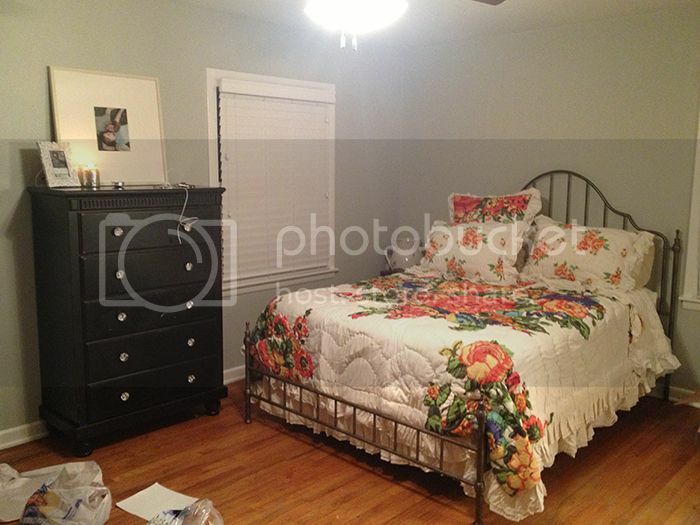 Then, I tried adding some bold pillows within the bedding color scheme. The pillow fill in the middle was going to be covered with a plain, monogramed sham. This look could have been cute, but was just too bright for us. 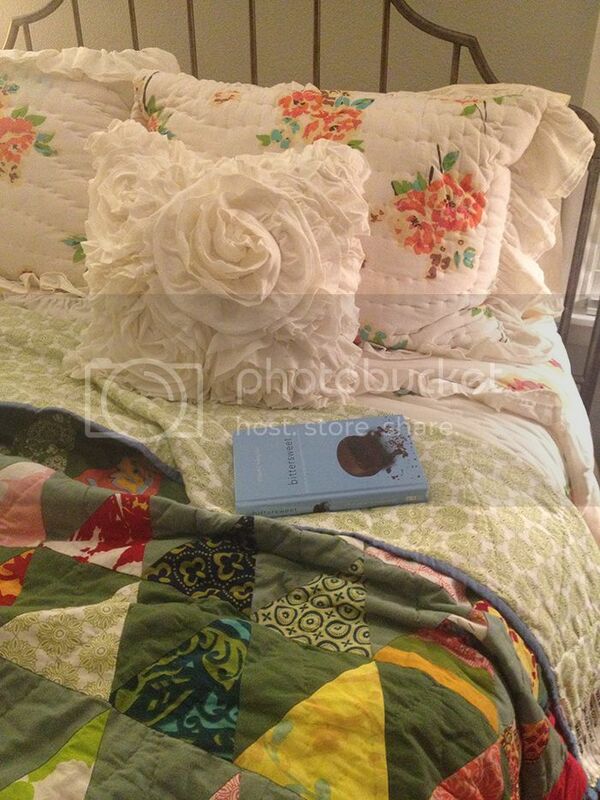 Then, I added a fun Anthropologie quilt To the top of the bedding to give it more of a layered look. Meanwhile, I was moving around the furniture once a week. Yikes. I couldn't find what I wanted. Midway through the process, Ben asked me something. One night he just said "I have an idea, can you keep an open mind?" I said yes, and that is when he asked for a coffee maker in our bedroom. I figured that it was the only thing he had specifically asked for in our home, and that I could make it happen. So this little nook was born. Born on top of my childhood nightstand. Note: During student teaching I was exhausted and over it 100% of the time. So little got done in our house and I look back and cringe. Things are finally, slowly, shaping up. At this point, I knew I needed to change something. I realized that the bedding we had chosen was way too vintagey looking for the modern gray walls. Something had to go, and at that point.. I knew it was the bedding, which could easily be the bedding for our guest room. 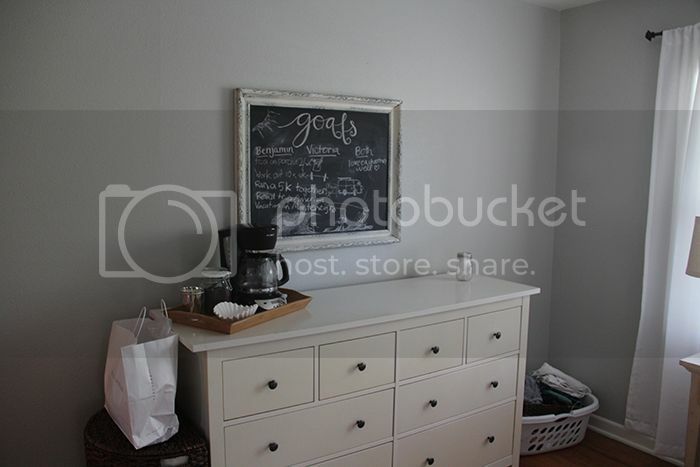 Thankfully, we were still cherishing some Pottery Barn gift cards after our wedding. I wanted something simple, clean, modern.. yet still beautiful. Oh, and that one too. Also, Ben hijacked the goals board for a bunch of weird things like drawing pictures of himself surfing and a sunshine and a VW van. At this point.. I knew what was holding me back from loving our room. It was the paint color. The gray was beautiful, but for someone else's bedroom. Our things weren't modern enough for the color. 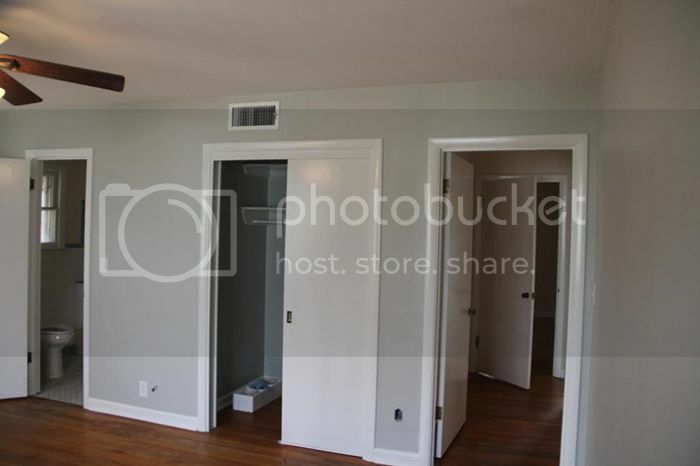 It also had cooler undertones, while all of our other paint colors had warm ones. So, one weekend, I said that enough was enough! I was going to admit my error in judgement, move on from it, and fix it. And now our room is one of my favorite in the house. 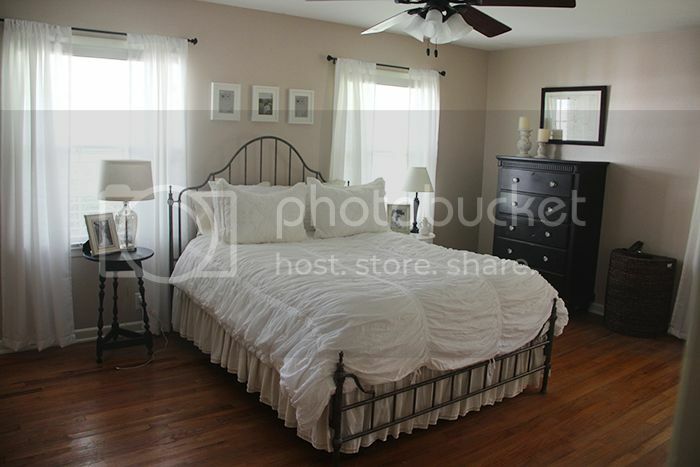 I have since done even more changes in this room (for example: actually fill the frames above our bed. haha!) We are also dreaming of a large jute rug. Moral of the story: You need a happy place to sleep that reflects your personality and style. I truly would loose sleep over this room and that is ridiculous. It wasn't a beautiful place that welcomed us to rest and it really did affect us. I'm so thankful to have realized this and started over! What room in your house could use some sprucing? Are there any painting projects you could tackle this weekend? Do any photographers want to come over and teach me how to photograph my house? Love it! The goals blackboard is such an amazing idea & great way to keep on track. You are very talented. Want to come help me with Kymee's room? Love the make over! Your room seems like such a retreat and the mini coffee bar tops it off. 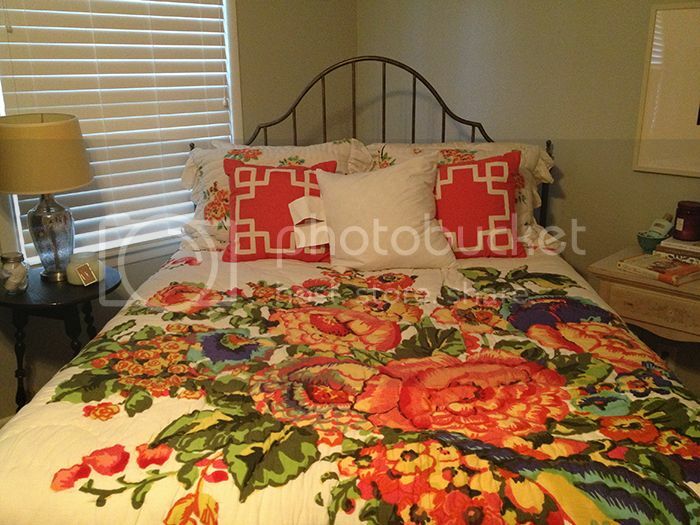 And now I'm even more convinced we're nearly the same person because I have the Esperanza bedding from Anthro, too! 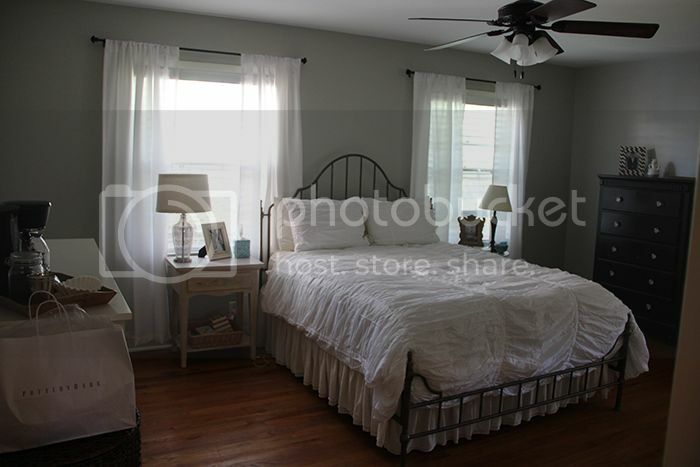 :) It's fresh, fun, and bright, but the white quilt with the ruching from Pottery Barn you chose is GORGEOUS! Excellent choice. I love it! I cannot wait to have warm tans and taupe colored walls again. Living in military base housing is not ideal for that! 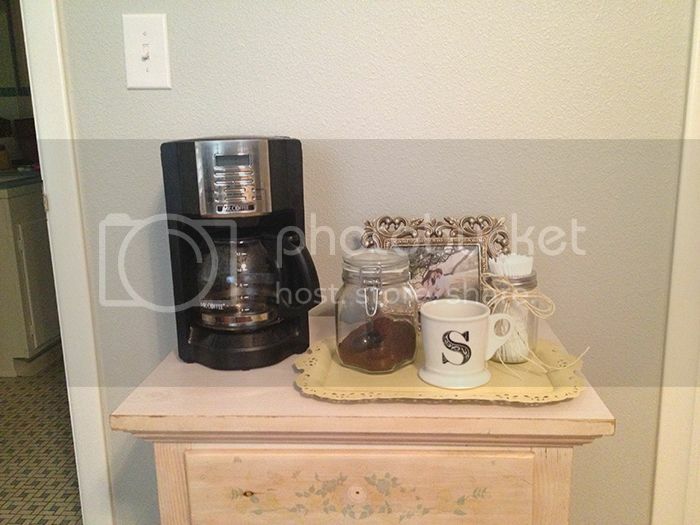 I also love ya'lls bed frame, and Ben's idea of a coffee bar in the bedroom. When I eventually buy my first house, I'll be calling you to come decorate it! I love your style! And this looks like such a chic and calm room. I am still working on my bedroom at my parents house, a few more years here so it's a constant work in progress! wow! what a drastic (but AH-MAZING) change! looooove what you did with it (and can't wait to see it in person! ).